So In 3 weeks time the 3rd edition of the Desertfest London takes place and things are in place for the most alternative line up to date. As you’re probably aware this years headliners are SPIRIT CARAVAN, KVELERTAK & BORIS plus an awesome array of bands from all over the globe flocking on Camden to ‘Riff n Shred‘ through the weekend. They can finally reveal the FINAL STAGE TIMES are now online. They’ve been working hard to make sure that there are minimal clashes ( hence the delay in getting this out to you ) and they hope this helps you guys schedule your weekend or day in Camden! Check out the Stage Times for Desertfest London 2014 HERE. In other news, they are extremely excited to announce the VANS STORE will be hosting a whole host of musical talent over the weekend of the 25-27th April. 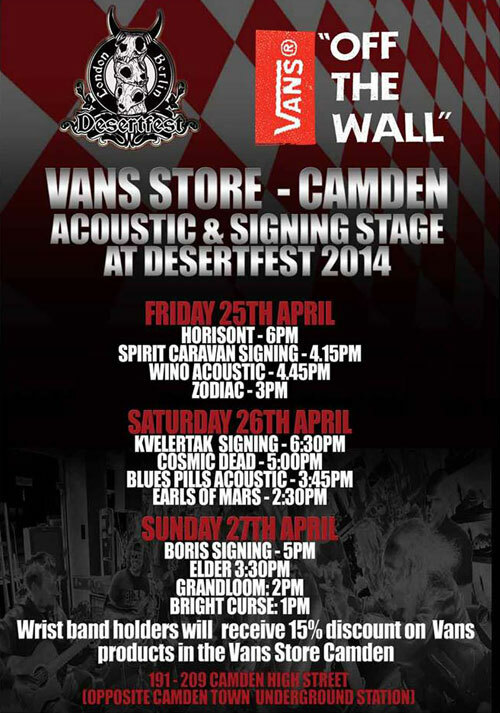 the good folk at Vans have been ever so generous and have given any Desertfest attendee 15% off at the store. Desertscene also have 3 shows lined up in June with a heavily influenced US feel to it, including a special UNIDA & Co Headline Show at the Garage, you don’t wanna miss this one! More news to follow soon! 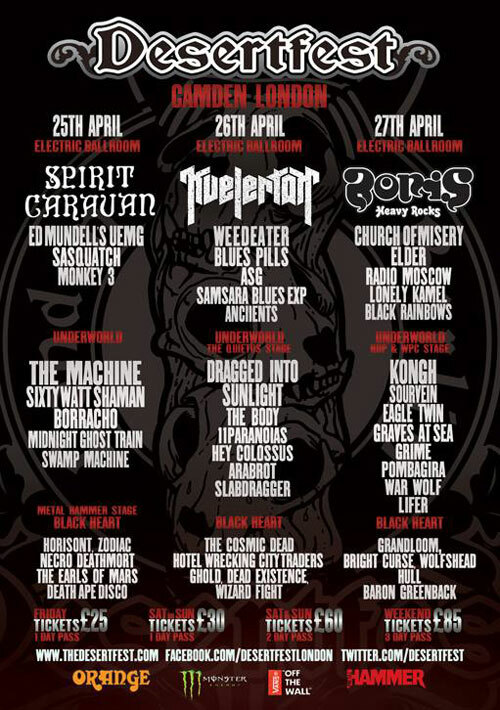 DesertFest London 2014 takes place over the weekend of the 25th-27th April 2014 across 3 venues in Camden, London and weekend passes are available from Leeds Tickets HERE.